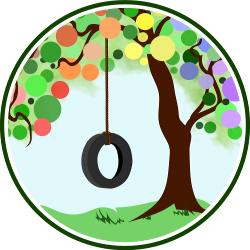 This entry was posted in Cleaning and Organizing, Natural Learning, Playtime, Practical Home Help, Reading and tagged DIY, frugal, homemade, imagination, organization, play, playroom, toys. Bookmark the permalink. Back when we designed and built our home, we adopted a motto from the Shakers: “A place for everything, and everything in its place.” We were sure to include plenty of closets and cabinet space. Flash forward to parenthood and we realized we didn’t plan for play, which has led to a lot of clutter. So, I’ve decided to turn the empty room over our three-bay garage into a playroom for our son Joshua. Book Nook – Relocate Joshua’s book shelf and books, find a comfy rug, add pillows and blankets for cuddling up. We also have a little rocking chair that I’m planning to paint, but I’m not sure what color yet. I like the idea of painting it red, but I don’t know if I can be quite that bold! Play House – or fort, or castle. I’m on the hunt for the perfect cardboard boxes for the job. I’ve been saving some long, skinny boxes that I think would make great towers, but I need to find big ones. I love the idea for a cave of stars from Play at Home Mom, but I want to try to do it with constellations. 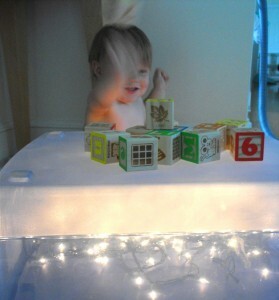 Sensory Play – Our homemade light box plus a felt board, magnet board, and musical instruments. I plan to make what I can and use the toys that Joshua already has for this. Table and Chairs – A kid-sized set would be perfect for working on projects, reading, and eating snacks. My husband could build these, but this is his busy season at work so I’m on the hunt for a good bargain. Toys – Joshua has a ton of toys to relocate and I want to leave some open space for riding around his tractor, pushing his dump trucks, building with blocks, fixing things with his tools; maybe I can convince my husband to build some cubbies to help keep them organized. Other – in the long term, adding a dress-up area, an art area with an easel for arts and crafts, maybe a stage area. I’m not exactly sure and Joshua’s interests will guide us. I’m hoping this will help to reduce the craziness of toy clutter, or at least move it to a play room instead of being front and center in our living room! How did you design your child’s play area? The apple tree/ladder made me think of you! We have a play area upstairs in the living room that houses a toybox (that just got weeded out), the train table and a bookcase. Plus, I have a bin for the library books. I keep the art supplies upstairs right now so he can create either with supervision or by himself at the kitchen table while I’m working on supper. I’m still looking to add to our seasonal book collections so that as things change, I can swap out books that are more educational in nature, but still age appropriate. We have a full basement, so I’ve set up one corner with child-sized table and chairs, puzzles, toys and blocks. Then, on the side that is empty, we have the soccer net and his ride-on toys. I brought in his slide and it spends time where ever we need it (up or downstairs) along with the trampoline. Additions for the basement I’m hoping to work on this winter are a play kitchen with felt foods and then an art wall with a chalk board and a white board. I’d like to add in a felt board somewhere so we can use it when we do “school”. I’ve starting doing “tot school” with Liam and the more I look for things to do with him, the more I lean toward the Waldorf/Montessori model of education. He already sits at the table in a chair and not a booster and uses the adult silverware and cups. We are currently working on the kitchen and when the cupboards are done, I’m planning to have one set up with all the kids’ dishes and cups and a basket with silverware. I love to watch Liam play and I’m so excited to see what Sylvi brings to the table, so to speak. She’s much for adventurous and active than he is, so it should be fun! We don’t have a designated play room right now – our current space won’t allow. But, we’re going to be building a house soon and I can’t wait! You have some awesome ideas! I wish we had room for a playroom! You’ve got great ideas. Right now we’ve transformed our dining nook into a play space and moved our dining into the living room. We’ve also cut down on toys (and keep meaning to do more) and have realized how many toys can be shared communally — like ride-on toys at indoor play gyms at the community centers — so we don’t feel as deprived without the big stuff. Losing our dining area felt weird to me at first, but now I’m so glad we gave our kids a little space that’s just their own and designed for them. We have a little area rug, a little table and chairs from Ikea, and a bookshelf with books and bins of toys though we’d like to think of a better way of displaying them without looking cluttery so Mikko knows what’s there to play with.